Have you got a cheerleading competition or tournament soon approaching? 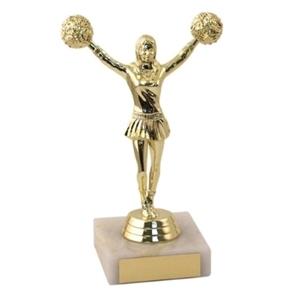 We have an extensive range of cheerleading trophies that are suitable for an array of occasions whether it be an elite level competition, grassroots tournament or a school performance. We have over 30 years of experience in supplying cheerleading trophies across the UK. Since we became established we have developed a firm reputation as one of the leading trophy suppliers and engravers in the UK. We are proud to offer quality trophies at affordable prices. What’s more, you can guarantee excellent customer service that cannot be rivalled. Browse our range of cheerleading trophies and without a doubt, you’ll find exactly what you’re looking for. Here at Aford Awards we offer a variety of cheerleading trophies, medals, cups and plaques for an array of achievements and occasions. Whether it be cheerleader of the year, most improved cheerleader, 1st place winner or a trophy for mini cheerleading stars, we’ve got everything covered to make your competition, tournament or awards evenings and special occasions. As well as our collection of cheerleading trophies, we also have an abundance of medals, cups and plaques that could also be of interest. What’s more, if you’re unable to find what you’re looking for, we also offer bespoke trophies which means you can create a completely unique trophy for your needs. We are proud to offer trophies manufactured from the best quality materials at affordable prices. We go above and beyond to ensure your trophy remains looking great year after year and is something you’re proud to show off. All of our cheerleading trophies come with a complimentary cheerleading-themed centre, a personalised club badge or tournament logo or optional text if required. The Aford Awards service doesn’t stop there; in addition to a surplus collection of trophies at affordable prices, we also make it our responsibility to ensure you’re getting the best value for money. What that means is, if you find an identical trophy elsewhere on the market at a cheaper price, we won’t just match that price - we’ll beat it by 5%. For more information on how you can get trophies at the best value, please read our Price Promise page. To continue offering excellent customer service, we also offer free trophy engraving with all of our purchases if possible. That means, with any trophy, medal, cup or plaque you’re able to add a touch of personalisation! If you’re looking to personalise your own valuable belongings, we can also make that possible too! Our premium engraving service means you can get engraved items such as jewellery, tableware and electronics for example. For more information on our cutting edge engraving facilities and premium service, please visit our premium engraving page. If you have any enquiries about the products or service we offer, please do not hesitate to get in touch via 01622 738711 or using our online contact form. Alternatively, if you’re interested in other relevant trophies, please visit our sports trophies page, winner trophies, 1st, 2nd and 3rd place trophies and cups.